Mental Health First Aid (MHFA) is an interactive 12-hour training course designed to increase mental health literacy. 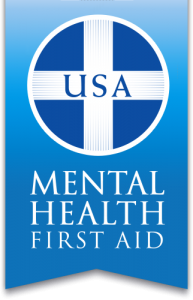 Just as CPR training helps a non-medical professional assist an individual following a heart attack, Mental Health First Aid training helps an individual who doesn’t have clinical training assist someone experiencing a mental health crisis. In both situations, the goal is to help support an individual until appropriate professional help arrives, with the added underlying intention to promote health literacy. In the US, Mental Health First Aid is managed by the National Council for Community Behavioral Healthcare, the Maryland State Department of Mental Hygiene, and the Missouri Department of Mental Health. More information on the program is available at www.MentalHealthFirstAid.org.